In Twproject you can create your projects assigning skills instead of resources. This is very useful during project plan phase. Having both in the same system makes it possible for example to share project tree creation and maintenance between planning project managers and production project managers. We assume below that we start from a future project. We created departments and teams, with people in teams. Each department team has a manager. Then for each team we need the members of the team (obviously) but also a (or also several) placeholder resource which will play the role of team skill(s). This resource should not have a login, and should be put in the team where it belongs to. The crucial point is the resource capacity – working hours per day, which actually is the potential output of the team for such skill. In this case we have 6 Linux experts in the team, who can dedicate 5 hours out of 8 (3 are taken by say “Business As Usual”), so the potential output is 6*5 hours of “Linux Expertise” per day. 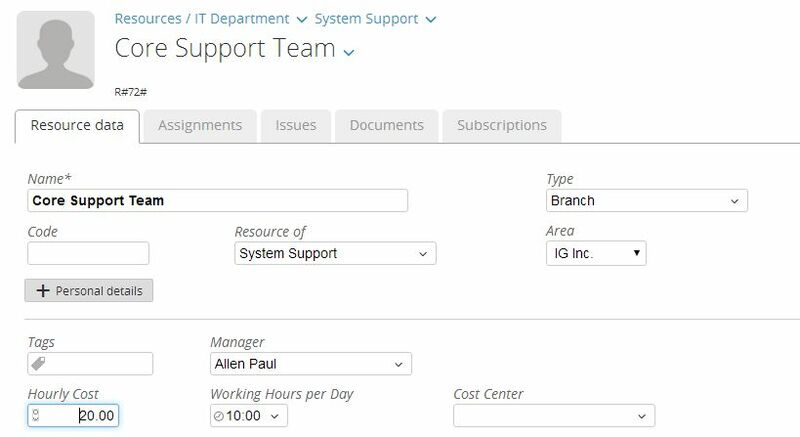 Notice that this holds only for planning tasks, as in the day to day operations load is not given by such simple availability but you have to use the operator load where are taken into account open assignments but also worklog inserted which progressively frees the team members from the assigned hours. So we suppose to have a future project called “Sigaro”, the idea being that at this moment we know skills required and can only predict effort. We surely now know the core structure, and we even have some milestones. All this can be set in Twproject. Created the Gantt/tree structure, we assign the “Linux Expert” skill with an estimated effort of 80 hours. More future projects you will have, more useful it will become. What happens when the time comes that the project has to be started? First generate a “snapshot” of the project, which will be the project as planned. You will add assignments for real people: you will assign a project manager, resources with the skill’ skills (sorry J), and the skill’ assignment can remain, as it does not record workload and worklog accumulation is not done for resources without a login. Notice that the worklogs you will be inserting will subtract from the operator load. The last point is important because this way you can check in the same operator load page the load of both “real” operators and of skills. As you have in the team both the skills and the real operators, by clicking “operator load” on the team you will see a load / availability overview.